I really enjoyed this book. It was one of those that I read almost entirely in one sitting, only pausing to tweet author Stacy Kade, "Can I give Zane a hug?" (She responded that yes, he needs one.) I grabbed this book off of Netgalley after seeing someone tweet about it. I'd met Stacey at last year's RT conference, but have never read any of her books. One really cool, interesting thing about this book was the idea of learning how to be human. We are an emotional, fun-loving, delicate yet powerful species. We form attachments to people and things, and we are motivated -- by love, by fear, by ambition. I really enjoyed reading how Ariane had to learn about humans -- what we are and what we do -- and then try to assimilate herself into our world. Stacey Kade did a great job of writing her so you never felt like, "This is WEIRD, I am reading about an alien." And the best thing is that Ariane comes to accept and use the best of both parts of herself. But for real, though. I'm off to hug Zane. Talk to you after Book #2. I really enjoyed The Ghost and The Goth and started following Stacey Kade on twitter. 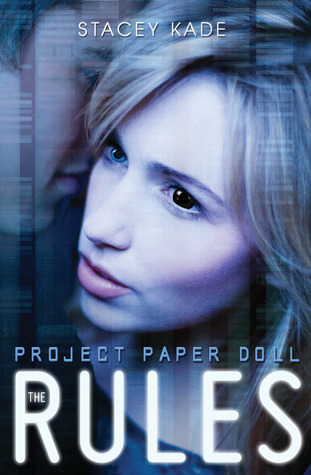 When she announced her latest trilogy Project Paper Doll, I was a little leery because I don't usually enjoy science fiction. I tried to read The Host by Stephenie Meyer and had to stop reading after a couple of chapters. I have been told countless times how great it is, but it just wasn't for me. I was afraid The Rules would be more of the same, but I LOVED it. I wouldn't really consider it science fiction. It is more of a contemporary with some paranormal elements. Like her Ghost and the Goth series, this book is told from a dual character point of view. Ariane is half alien/half human and spent the first 6 years of her life living in a lab (GTX). There was an explosion at the lab, which provided one of its employees the opportunity to help her escape. Ariene has been living with the employee, Mark Tucker, for the last ten years posing as his daughter. She attends the local high school, but must live by five very important rules in order to keep GTX from finding and recapturing her. Ariene lived a rather boring existence with minimal involvement with other students outside of school until Rachel Jacobs, the granddaughter of the head scientist at GTX, starts harassing her only friend, Jenna. Rachel is part of the high school's elite and decides to pull a prank on Ariene, which becomes very interesting when one of her friends turns the prank back around on her. Zane is the other narrator in the story and I absolutely loved his character. He is not at all the person Ariene though he was. The more she gets to know him...the more she begins to trust him and that is where rule number one is broken. Once one rule is broken....the rest quickly follow suit. There is a lot of action and high school drama mixed in with a love story that keeps the pages turning. I, too, will be counting down the days until the release of Project Paper Doll #2.